Greetings Tesla City Stories have been presenting an evening of live “radio” theater derived from the recently uncovered archives of the ultra-obscure Tesla Broadcasting Company (1943-1945) since 2014. It’s “pop archaeology” as performance art, or, more simply, a fun night of vintage entertainment! Each performance is unique with new episodes of vintage programs that range from comedy to drama to mystery to soap opera. 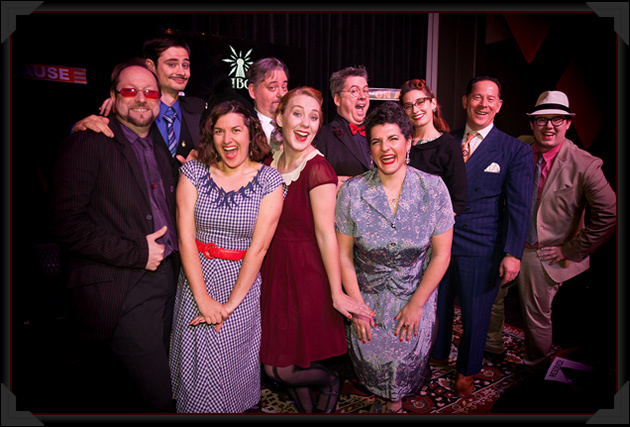 Our cast gets to show off their comedic skills as well as their drama chops on any given night, and they do it all in 1940s-era clothes that brings back the glamour of that bygone age. We have sold out every performance in the last two years and are excited to announce we are moving to a larger venue: The Old Church. This will bring our show to a bigger audience while also allowing us to make each performance bigger, better and more vintage-tastic! We consistently hear that we are one of the most enjoyable, most unique night’s out in Portland for our fans and audiences. And we need your talents to help us take this show to the next level! The Tesla City Stories is a teamwork-focused production with a clear philosophy of creating joy for our fans, audiences, and each other! We pride ourselves on being a fun, well-organized, vibrant production. We truly care about our cast and the experience of working together. We try our best to create a collaborative and creative working environment while entertaining our audiences in a novel and exciting way. We are looking to add 1-2 women and 1 man to our company. Since this is live radio on stage, voice talent is important…but so is stage presence. We want big, energetic performances that bring these stories to life just like they did when those voices were coming through the radios across America 70-80 years ago. So save the subtly for your next audition for an Ibsen play. This is radio, baby! So don’t be afraid to go big! Don’t worry, we are all actors too and we appreciate the effort auditioning takes. We are also looking for the ability to inhabit a wide range of characters since every show includes episodes of different programs with varying styles. One minute, you may be doing an episode about a terrible singer who is convinced she is destined for show biz greatness…and the next minute you will be doing an episode about a crime-fighting ghost that is battling thugs in cataclysmic conflicts between good and evil. Flexibility counts, so do some stretching before your audition! Auditions are being held Thursday, July 12th, 2018 3-7pm at the Shout House. Please contact us with your questions. The Shout House is *under* the Madison bridge, it can be tricky to find as GPS will often route you onto the freeway. This is an open audition, there are no appointments or specific time slots available. We will surely do our best to see everyone — but it is possible you may not be seen, depending on how many folks plan on attending and what time you get there. The audition is on a first come, first served basis. Performances are paid per show. There is one 2-hour rehearsal the week of each show. Food provided. Yum! We have an expectation that you will be on time to all show related activities. Memorization of lines is *not* required however preparation for your characters/performances are required (i.e. scripts marked up/read, questions prepared, research completed). You should be able to help market the show through materials provided by us and through your contacts, friends and social media. This helps us grow and spread the love. You are *not* required to help set up the show but there is a very well organized, short tear-down after each show that you are required to assist with (packing up, no heavy lifting). Each show, you will do the same tear-down tasks so it becomes quick and easy. It’s not hard and this process really helps with everything. Thank you in advance! Absolutely no alcohol or inebriates allowed before or during performances. Afterwards, however we can all head to a local Speak Easy. You should be able to record shows also for a podcast on a separate day (awesome to have for your reel). Some months you may not have many lines and other months you may be the star. You should be okay with varying amounts of “air time,” however we always strive to find plenty for each cast member to do. The show is never the same show twice, one of the things audiences love about the show. With 10 shows a year (about once every 4-6 weeks) our schedule is unusual. Each show is one performance only. We cannot excuse cast members from Tesla performances to be in other shows/productions. This can be sometimes difficult to navigate for actors and we can certainly sympathize. If not for this policy, we would face the specter of never having a full cast every month (serious illnesses, and emergencies are obviously excused). We ask that each actor commit to at least the upcoming “season” of each show run (3-4 show seasons). We want to be clear this is not meant to be draconian, but rather to ensure the continuous quality and integrity of our production. We encourage you to listen to/watch period pieces from the 1930s and 1940s before you audition. YouTube is your best friend for this. LAZARUS ST GEORGE/THE WRAITH: Lazarus is a man is his mid-30s. Very well-educated, an archaeologist who speaks with charming gravitas. Not exactly humorless, but a generally serious person. Warm with his wife and friends. On the other hand, his crimefighting alter-ego, The Wraith, is ominous and portentous, grim and spooky, like The Shadow without the maniacal laugh. PERSEPHONE ST GEORGE: Persephone is/was a woman in her late 20s. She’s the ghost wife of LAZARUS ST GEORGE who, though just a spirit, carries on a supportive, loving relationship with her husband complete with teasing banter, only occasionally expressing a sadness at their ethereal separation. She was a fellow archaeologist and is brilliant and far funnier than her mostly dour husband. JURGENS: Jurgens is a man in his early 20s. He’s the wryly funny chauffeur of BLEVINS DEBELL. Speaks with a working class Cockney accent. If you can do any regional/international accents, please let us know!